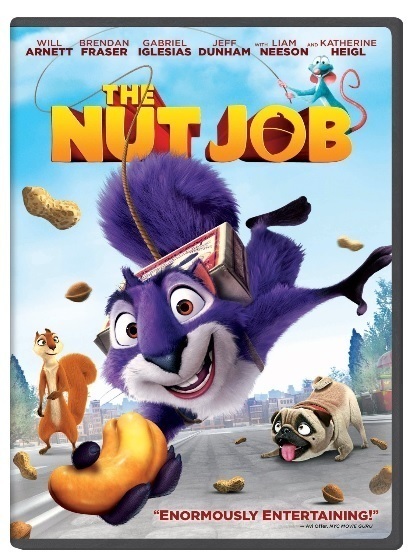 The Nut Job DVD Review plus Nutty Recipes for you to Enjoy! In celebration of the Home Entertainment release of Universal's hit-animated film The Nut Job, we've put together a special nutty recipe for you and your family to enjoy. See it below! My Experience: My family adores this movie! It is so adorable and wildly entertaining, not only for my seven year-old son, but for all of us. I loved it! We love the adorable main character, Surly the Squirrel and the many other endearing and funny characters throughout the movie, especially the cute pug named Precious. I loved the colorful scenery and perfect animation. A very entertaining story with a lot of hilarious adventure! Print out these FUN Nut Job activities for kids.